Einarsson adds in an interview with Fréttabladid that C14 analysis indicates that the cabin was deserted between the years 770 to 880 AD, which seems to indicate that it was built “well before the ‘historical first settlement” in the year 874. 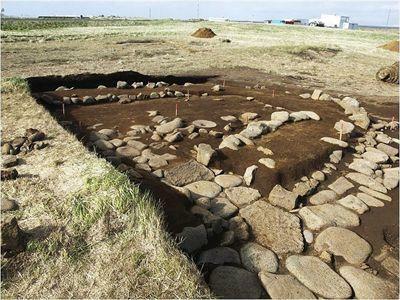 Einarsson says that his working theory is that it was an outpost from Northern Europe, Scandinavia or the British isles. Those men came to utilize the resources in Iceland: Birds, eggs, fish, whales and not least walrus teeth. Einarsson adds that old fables on the origin of settlement in Iceland have now been proved false. However, new theories will not easily make it into history books because of the natural conservative view of historians. The research in Hafnir is not completed. This summer the middle part of the cabin will be dug up and the work concluded next year. Not everyone agrees to this theory. Indi-Uni will have more on the controversy in the near future.